The Iola Toy Barn is centrally located on the grounds within the Iola Car show! Packed with Toys and Collectibles! “The Toy Barn” is inside the Iola Car Show! 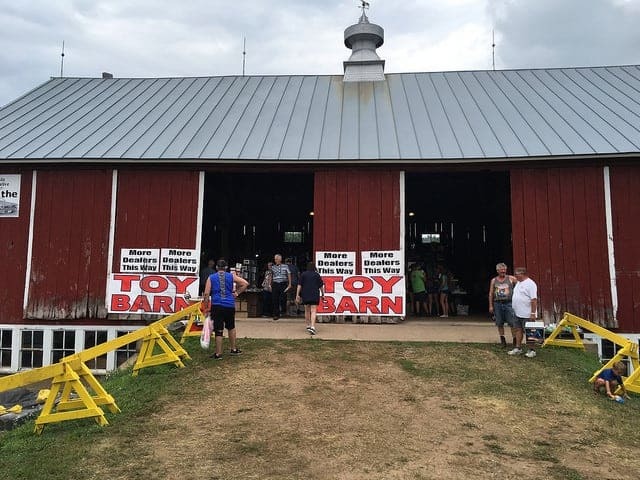 Annual – Toy Show & Sale Barn! Held during and inside the famous Iola Car Show! “The Toy Barn” is inside the Iola Car Show! Midwest’s largest Old Car Show held annually the 2nd weekend of July. Feature exhibit this year will be “Showdown in I-Town FORD versus CHEVY” . Other show cars 1983 and older will be classified as Post-War, Pre-War, Modified, All-Original and Blue Ribbon Concours. The show has a “Teamed to Learn” education tent, 4,430 Swap Meet Spaces, Car Corral area with vehicles 2000 and older. Great food and camping is available. Visit http://iolaoldcarshow.com/ for more information on admission to the car show and toy barn.